Being old, I recall a game that I enjoyed playing with my friends in college that was pretty well on every machine in the computer lab called Scorched Earth. You’d be in your tank and would try to shoot your enemies on the map by changing up your angle and power. You could play it straight-up but the best way was to allow all weapons and then fire something that would wipe out half the screen, hoping you’d manage to wipe them out without also destroying yourself. 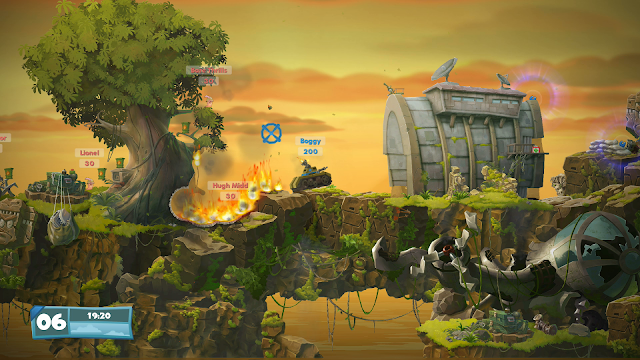 The mix of strategy and certainly silliness in that game is always what I’ve appreciated about the Worms series, which has absolutely been in that very same vein over the years. While you can try to play it more straight-forward with guns and grenades it’s the risk of mutually-assured destruction when you begin using much crazier weapons that makes it so satisfying, even when you only manage to kill yourself in the process. Starting with what has generally always worked well Worms W.M.D. is great to play locally with friends or online. You’ll have the choice of 1 on 1 play as well as against multiple people and the matches remain as unpredictable as ever as people jockey for position in the high ground and try to survive each other’s attacks. Items like the Ninja Rope and the Jetpack can be vital to aid in getting yourself into position so that you can then mount your best attack. From there, as always, the more traditional weapons will be available as well as the more ridiculous, including old stand-bys like the sheep and other more over-the-top munitions. 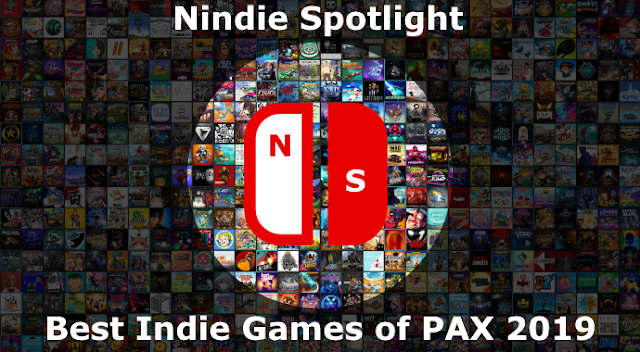 What’s new, and that changes up the strategic element of the game quite a bit are vehicles including a tank, helicopter, and even a mech suit. These provide not only new opportunities to kill one another but also often a new means of moving around the map in some cases so securing them can be vital. Another element that’s been introduced is crafting, which generally has a positive effect of staving off more powerful attacks and weaponry until a little later in the game as people try to either get elements from crates or dismantling other weapons and then choose what to make out of them. This adds a new layer of strategy to the game and can encourage people to give up their great strategic position in hopes of either getting supplies to work with or simply deny them from everyone else. For me the biggest surprise in W.M.D. is the volume of worthwhile single-player content. 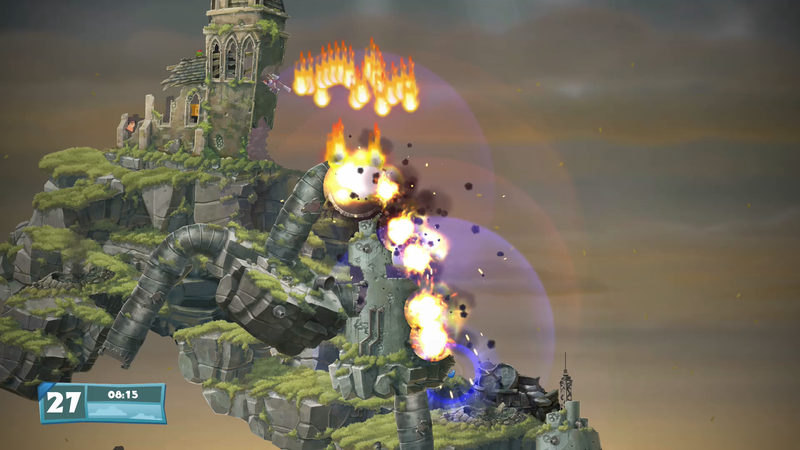 It may be that I’ve been away from the series for a while but I’d mostly remembered single-player fare in the Worms series essentially being the same as multi-player against bots. For this go-around there are multiple training modes, a substantial number of campaign missions with both primary and secondary objectives that help you refine your game, and then additional modes that include a very challenging D-Day style invasion of sorts that made for terrific fun! Of course as you play you’ll then unlock additional gear, voices, and victory dances, and more for you to customize your crew when you play online as well. 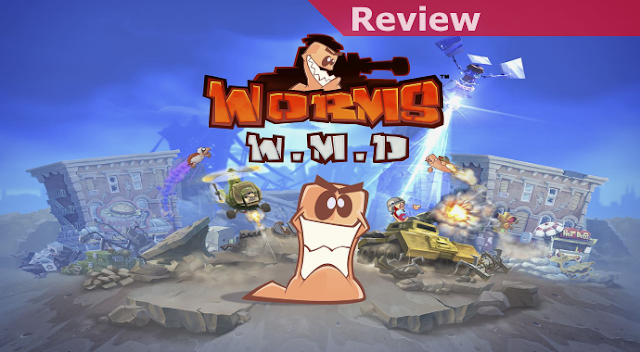 In the end I must say that I’m extremely impressed with the level of care and effort that has been put into making Worms W.M.D. worthwhile. With a series like this it seems like it can be easy to get comfortable and to phone in a new iteration with better graphics and sound but Team 17 has really shown an investment in this title that’s inspiring. By adding to the game in pretty well all directions they’ve managed to take an already-fun series and make it compelling for just about anyone to check out!